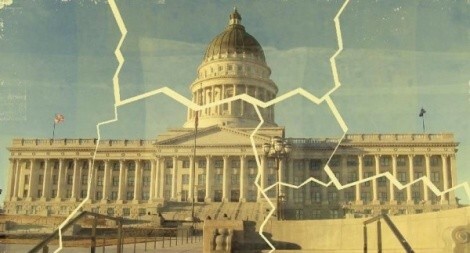 Could an independent commission fix Utah’s gerrymandered districts? If there were one place in Utah where it would be fun to be a Democrat, you would think it was Park City. After all, you’ve got company. Summit County voted for Obama in the presidential election 56 to 41 percent. Locally, however, Park City Democrats have to settle for Republicans representing them in the Legislature—including a state senator from Vernal who is a champion for the oil and gas industries. Ten years ago, Summit County’s population was about 30,000, or exactly the right number to form a complete legislative district. Instead, the Republican-dominated Utah Legislature split Summit County in two. Today some residents are represented by a Sugar House Democrat. Parkites—whose city was combined with parts of four rural counties—are represented in the House by a Coalville Republican. No resident of Summit County serves in the Legislature. No wonder Wright is a cheerleader for the Fair Boundaries Coalition, a group trying to get an initiative on the ballot that would have new voting districts—scheduled for 2011—drawn by an independent commission rather than the Legislature. The coalition has one year to collect 90,000 signatures to secure a place on the ballot. If passed by voters, the commission created by the initiative would be advisory. According to Utah’s Constitution, only the Legislature can set voting boundaries. But the Legislature would have to vote up or down on the commission’s plan. Many Fair Boundaries Coalition organizers are Democrats, but the drive is officially nonpartisan and has Republican supporters from areas of Utah where people feel they were screwed in the last redistricting, regardless of party. Tooele County is the example most often cited. Following the 2001 redistricting, the county was split into four Senate districts. Tooele County sends a total of six representatives to the Legislature, but only one actually lives in Tooele County, and he only officially represents three neighborhoods. The rest of the county’s representatives live in places like West Valley City, Lehi and Brigham City. One lives 200 miles away in Monroe. For the Democratic Party, Dillon says the result has been would-be Democratic politicians switching parties to run for office “simply because they don’t see how the Democrats can possibly win.” At the county level, elected offices—from the treasurer to recorder—are held by Democrats. But elections to the state Legislature are decided in Republican primaries, often with no Democratic candidate on the ballot for the general election. The 2001 redistricting split the city of Moab down Main Street. Novella Maia, chairwoman of the Grand County Democrats says, while Grand County voted for Obama, “the way the districts are now, it would be next to impossible for the county to send a Democrat anywhere outside the county. It’s a horribly gerrymandered mess.” But if Democrats think an independent-redistricting commission will change their electoral fate, they should think again—so says House Speaker Dave Clark, R-Santa Clara. Clark chairs a redistricting panel for the National Conference of State Legislatures. He is no fan of the Fair Boundaries initiative, saying the only thing an independent commission would accomplish would be to invite lawsuits. Todd Taylor, executive director of the Utah Democratic Party, notes that for 2001´s redistricting, Democrats proposed eliminating just two sitting House members, including one Democrat, to accommodate a decrease in population growth in one of the districts. But in the final maps, several Democratic representatives were drawn out of existence while some Republicans in similarly shrinking districts were left alone. Taylor says Democrats fully expect to “take hits” due to population shifts this time around, but adds, “We’re looking for a fair process.” The state party will vote on supporting the Fair Boundaries initiative at its state convention this month. But, Clark says, even if the Fair Boundaries initiative passes, Republicans will come out ahead in 2011. That’s because redistricting has less to do with politics than population shifts. Nationally, Democratic-leaning areas in the Northeast are losing population, while Republican areas like Texas, Arizona and Utah are gaining. In Utah, population growth has slowed to a crawl along the east bench, while Republican suburbs are booming. After redistricting, Clark predicts as many as six house seats will move to the growing communities in southern Salt Lake Valley, northern Utah and Washington County. After 2001’s redistricting, some Utah Democratic lawmakers complained about being thrown into newly drawn districts where they were forced to face other sitting Democratic lawmakers. “That is absolutely going to happen again,” says Clark, who recently appointed a lawmaker to head up Utah’s 2011 redistricting committee.